I really really like Nutella. Always have. Always will. It is part of my baking repertoire (Nutella scones anyone?) and it is the one hi/low foodstuff that is a constant in my pantry. However, over the years, I have been cheating on Nutella – experimenting with all sorts of homemade versions (including this one featured in our second book, Baked Explorations). I am exploring alternates not only because I am wary of palm oil as a main ingredient, but also because lately my sweet tooth has gotten..well…slightly less sweet. 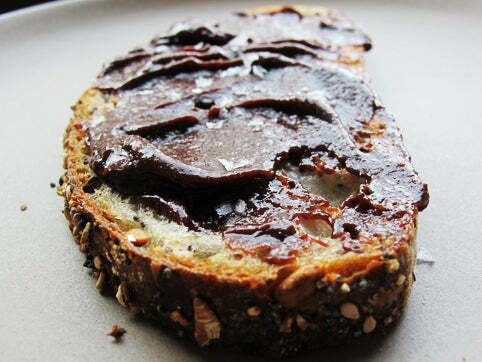 And Nutella, while lovely, is quite sweet – sugar is the first listed ingredient. 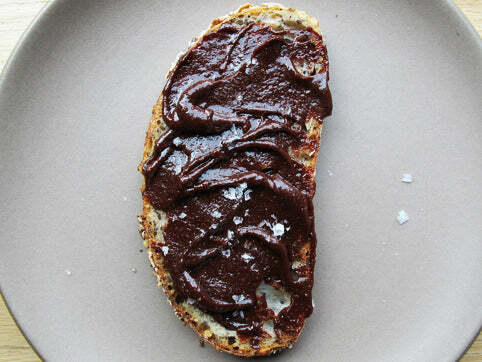 The beauty of making your own homemade Nutella-style spread is that you are in control. You can play with the balance of the main flavors – the ratio of hazelnuts to chocolate. You can increase or downplay the sugar (a little goes a long way). And well, the chocolate decision is all yours. : milk or dark or a little bit of both. Truth be told, though I have rediscovered the joys of milk chocolate all over again, I think dark works better in many homemade Nutella/gianduja recipes. And don’t forget about the salt. All of my various DIY Nutella incarnations have been vastly improved with a dash of Maldon salt to finish. At the moment, I am having quite a lovely affair with the Nutella recipe from Canal House Cooks Every Day (a great book btw). It is richer than most: lots of dark chocolate and hazelnuts with only a hint of added sugar. It is EASY to make and it spreads like a dream. It is definitely more chocolate-y than my go to recipe. And that is okay. 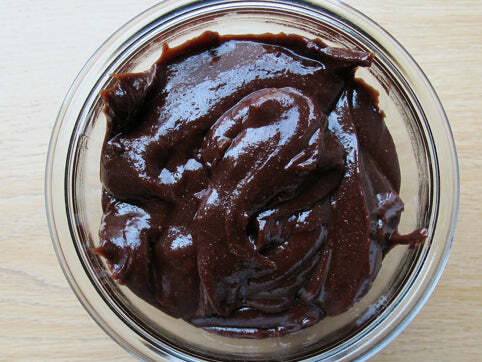 Chances are, no matter which homemade Nutella recipe route you go, you will be very very happy. -If you want to save a few steps, buy skinned hazelnuts. Or you can um…sorta easily…skin them yourself. I am not a fan of the boiling method (too many more steps for me), but some people are crazy for it. -90% of the time, hazelnuts will release enough natural oils to form a paste when you whir them through the food processor. 10% of the time, they will not change from powder to “butter”. Hazelnuts, and their oil content, vary widely by batch (producer, length of time on store shelves, etc…). If you can’t coax enough oil from the nuts alone, you can add a few tablespoons of natural hazelnut oil and keep processing. In a pinch, vegetable oil will do. -You can sub a handful of milk chocolate in this recipe (in a one-for-one sub) with some dark chocolate. -Technically, you can store the finished Nutella at room temperature, tightly covered for up to a week or so. I usually play it safe and pop it in the refrigerator. If I plan ahead and know when I am going to use it, I will remove it from the refrigerator an hour or so beforehand. But honestly, it spreads fine/tastes great right from the fridge. Preheat oven to 350 degrees F. Spread the hazelnuts out on a small baking sheet and roast until toasty brown in color, about 12 minutes (I usually flip the nuts half-way through the bake time for an even roast). Allow to cool completely. 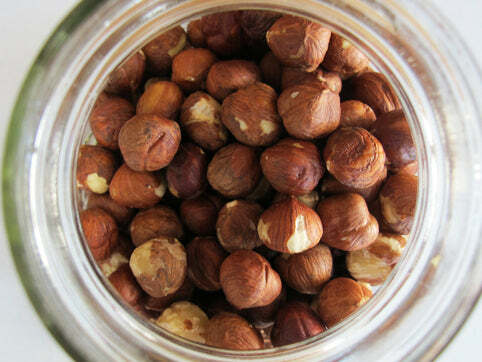 Place the hazelnuts in the bowl of a food processor and sprinkle with sugar. Process until a smooth, buttery paste forms, about 3+ minutes. Add the butter and process until just incorporated. Meanwhile, melt the chocolate, stirring often, in heatproof bowl over a pot of simmering water. After the chocolate is completely melted, whisk in the cream then the hazelnut paste. Pour into a glass jar. The gianduja will thicken as it cools.